Details of each “Post Configuration” can be found in the description below. The above products are recommended for installation or mounting of the Surface Mount Flat Top Square 2" Cable Railing Post. Surface Mount Flat Top posts provide the foundation for a cable railing system. 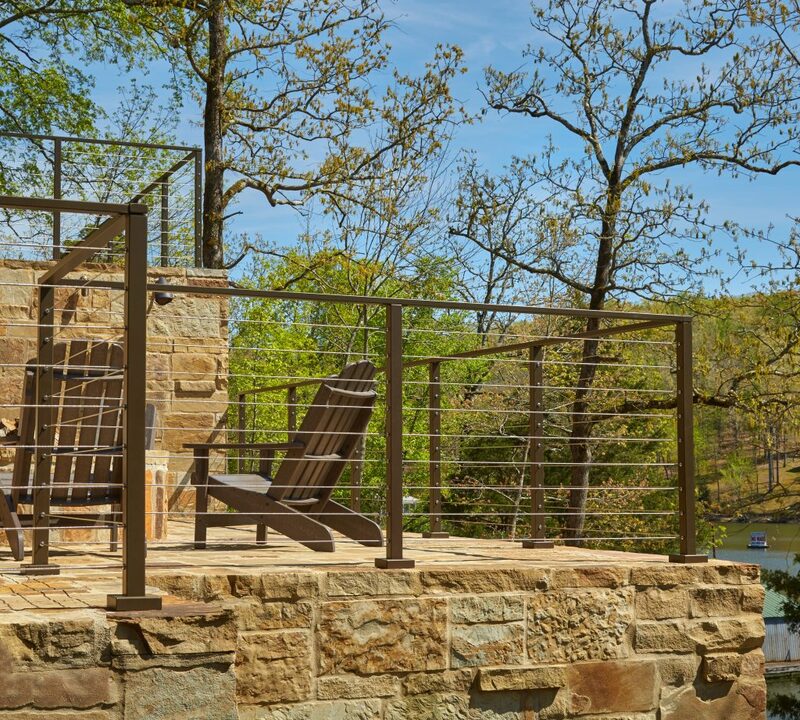 Our cable railing posts are available in multiple material types (2205 Duplex Stainless Steel, 304 Stainless Steel, & Aluminum), and in multiple finishes (Brushed, Powder Coated Black, White, Pewter & Copper Vein). All holes are drilled with 3.125″ spacing, and we recommend putting a post at least every 4 feet to reduce deflection and ensure that you meet code. Guide to getting started with Viewrail. Layout example shows flat top posts, in conjunction with Universal Top posts on the staircase. “A” – The “A” post is designed to be a start or end post on level runs. It has level 1/2″ holes drilled on both sides of the post. Recommended fittings: “Level Tension Kits” (36″ – 10 kits, 39″ – 11 kits, 42″ – 12 kits). “A-2” – The “A-2″ post is designed to be an intermediate post on level runs. It has level 1/2” holes drilled on both sides of the post. Recommended fittings: “Steel Insert Sleeves” (36″ – 20, 39″ – 22, 42″ – 24). “A-5” – The “A-5″ post is designed to be an intermediate post on level runs. It has level 5/16” holes drilled on both sides of the post. 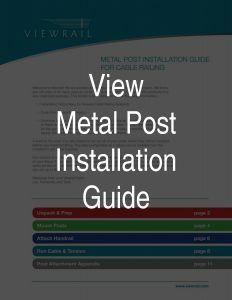 The cable will simply pass directly through the post, no additional fittings are required. “C” – The “C” post is designed to be a level corner post where one run of cable ends, and another begins (going left or right depending on your selection). It has level 1/2″ holes drilled on both sides of the post, and a set of KeyMount holes turning left or right. Recommended fittings: “Level Tension Kits” (36″ – 10 kits, 39″ – 11 kits, 42″ – 12 kits) & “KeyMount Kits” (36″ – 10 kits, 39″ – 11 kits, 42″ – 12 kits). “D” – The “D” post is designed to turn a corner from an angled staircase to a level balcony turning left or right. It has 1/2″ level holes on two of its faces, a 1/2″ hole holding tension for the angled run, and a 5/16″ hole on the side of the post facing the angled run. Recommended fittings: “Angle Tension Kits” (36″ – 10 kits, 39″ – 11 kits, 42″ – 12 kits) & “Level Tension Kits” (36″ – 10 kits, 39″ – 11 kits, 42″ – 12 kits). “F” – The “F” post is designed to be a start post on level runs. One side of the post has level KeyMount holes drilled into it, the other three sides of the post are completely clean (pick this post for an extra clean look). Recommended fittings: “KeyMount Kits” (36″ – 10 kits, 39″ – 11 kits, 42″ – 12 kits). “G” – The “G” post is designed to transition from a stair (angled) section to a level section while maintaining your handrail height. It has 5/16″ holes drilled on opposite sides of the post. Recommended fittings: “Adhesive Sleeve” (20, 22, or 24 sleeves depending on handrail height). Additional Hardware: The Postside Handrail Bracket will make transitioning this handrail much easier. “H” – The “H” post is designed to transition from 36″ tall stair section to a 39″ or 42″ level balcony section. It has 10, 5/16″ offset* holes drilled on opposite sides of the posts, in addition it has one (39″) or two (42″) KeyMount holes drilled at the top of the high side of the post. Recommended fittings: “Adhesive Sleeve” (20 sleeves) & “KeyMount Kits” (39″ – 1 kit, 42″ – 2 kits). Additional hardware: The Postside Handrail Bracket will make transitioning this handrail much easier. “I” – The “I” post is designed to turn a corner from an angled staircase and change heights to a level balcony turning left or right. It has 10, 5/16″ holes facing the angled run and 10, 1/2″ holes opposite those, and 11 (39″) or 12 (42″), 1/2″ holes drilled on the two level faces. Recommended fittings: “Angle Tension Kits” (36″ – 10 kits) & “Level Tension Kits” (39″ – 11 kits, 42″ – 12 kits). Additional hardware: The Postside Handrail Bracket will make transitioning this handrail much easier. 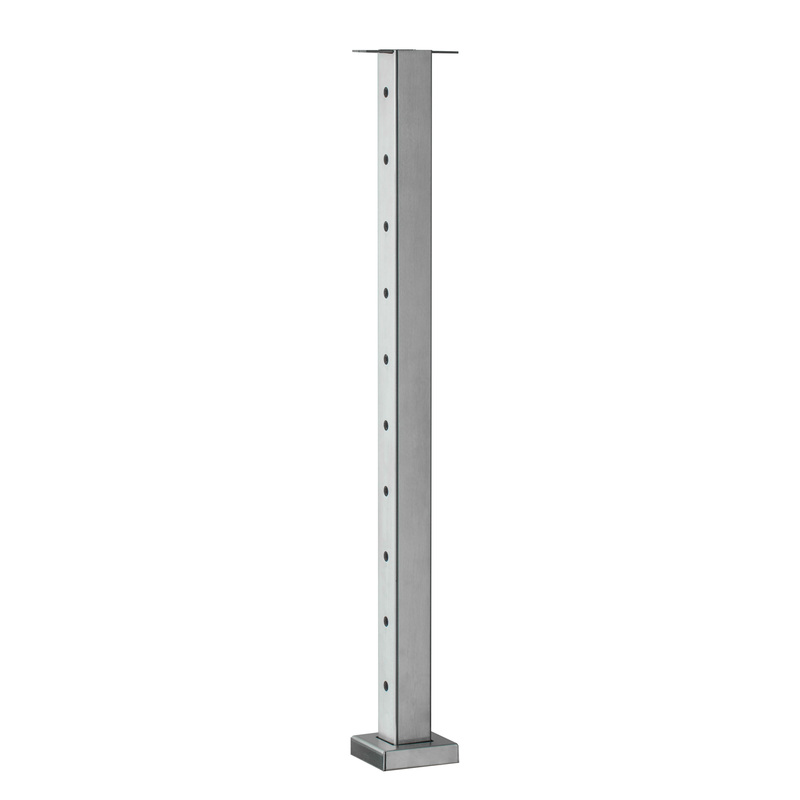 “R” – The “R” post is designed to be a start post on level runs that can mount directly to a wall. One side of the post has level KeyMount holes drilled into it, the opposite side has 1/8″ holes that allow you to use our 2″ trim screws to fasten the post to the wall. Recommended fittings: “KeyMount Kits” (36″ – 10 kits, 39″ – 11 kits, 42″ – 12 kits) & 2″ Trim Screws (15). “S” – The “S” post is shipped without any holes pre-drilled in the post itself (handrail bracket and foot still come pre-drilled). Select this post if you have an application where cables aren’t necessary but you still want to run handrail, or in a custom application and you want to drill the holes yourself. * All offset holes are drilled at 40 degrees (the typical angle of a staircase), these 40 degree holes work with angles between 36 – 42 degrees. If you staircase falls outside those angles custom hole drilling can be requested at no additional charge. Posts are manufactured 1″ shorter than their defined height. This will allow you to be at the exact height with our 1″ tall metal handrail, or slightly over with our 1 5/8″ tall 6000 series handrail. Mounting feet come with 4 holes (6 holes on “B” posts) for 3/8″ fasteners. The handrail bracket also comes with 6 pre-drilled holes to secure the handrail. If you live in coastal region (within 50 miles of salt water) you want to select 316 stainless steel. If you are within 2 miles of the ocean you also want to add our clear coat protective finish on top of the 316. The stainless steel posts are a hand polished stainless steel. The finish is created by with an American worker and polishing wheel working with the steel products. The finish is polished to a bright finish with enough polishing lines to give character to the light as it reflects off. Here is what our customer’s say, “High quality” … “Beautiful Finish” … “Very Durable.” Posts are pre-drilled with 3.125″ spacing to accommodate our cable railing system. Custom hole drilling can be requested. Mounting feet with 4 holes are provided for 3/8″ fasteners. They can be fastened to concrete or wood with the 4 mounting holes provided at the bottom of the mounting feet. Since there is a such a wide scope of fastening situations, fasteners are not provided. Angle posts have holes drilled at a 40 degree angle which will accommodate most stairways from 37 degrees to 42 degrees. They can be ordered as 3-way and 4 way with holes on 3 sides or 4 side of the post to allow for creating right angles from posts. Is this price for one post? Susan, Thank you for your question. Yes, this is the price for one post. We would welcome the chance to work with you on your specific project. Feel free to email us directly at orders@stairsupplies.com to discuss your project with us. How impervious is the clear coated aluminum to seasonal changes outdoors, in semi-coastal areas? Does it need to be re-coated with clear coat from time to time? It’s very difficult to know for sure how the product will perform in your specific location. We’ve been selling this specific finish option for a little over a year, and haven’t heard of any problems. Assuming the finish isn’t damaged during installation then it shouldn’t need much maintenance for several years. concerning the color selections, which is a brighter white, apollo or bone white? do you have a matching spray paint available? Apollo White is a brighter white than Bone White. You can check out this Post Materials and Finishes Page for a side-by-side comparison of our powder coat colors. We have touch-up kits available for powder coats that can cover scratches or small sections that need paint. Please let us know if you have any additional questions! I prefer the flat top style shown here. What is the application for stairs? I don’t see an angled mount option. Thanks!! Unfortunately, there is not a flat top option for stairs or angle mounts. Because there is no flexibility in the bracket, it would require very precise measurements to have the flat top work properly. Further, many projects have varied angles from step to step because of building inconsistencies and house settling. For all these reasons, we prefer to use the Universal Top option on stair and angle applications. The height designations on our post (36″, 39″, & 42″) represent the handrail height from the surface of your floor to the top of your handrail. With a 36″ in post & our 1″ x 2″ metal handrail, your overall handrail height will be 36″. If you have any additional questions, please call our support team at 1 (866) 226-6536. I’m interested in installing LED lighting under the railing for my project. 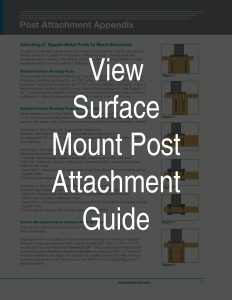 With the Surface Mount Flat Top 2″ Posts, is there a gap beside the handrail bracket inside the post to allow wiring to be brought up through the base of the post and up to the bottom side of the handrail? I would route a groove in the bottom of the handrail (wooden) to take the wiring to the LED unit. If the handrail bracket fills the interior of the post, could a 1/2″ hole be drilled in the bracket to allow the wire to pass through? There’s no gap to run the wires through. There’s a metal plate inside the post that the bracket attaches to with a single screw (the image on the website with 4 screws is outdated). 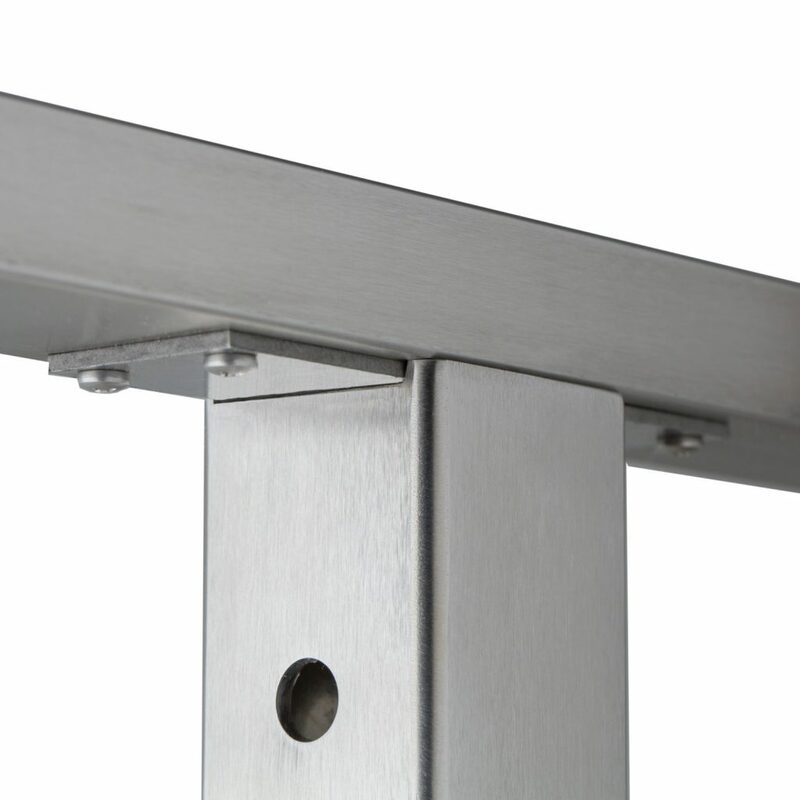 You could certainly drill a hole through the plate and the bracket which are both stainless steel.